Residential installations of heating and cooling systems are as unique and varied as the homes they go into. Some systems require very specific parts and have particular guidelines for installation, which ensures your system stays highly efficient. We also have a large selection of traditional systems and even have a few “green” options for our environmentally conscious customers. We install systems for many different needs. Our customers for residential systems are homeowners or builders in the process of construction on a new home. 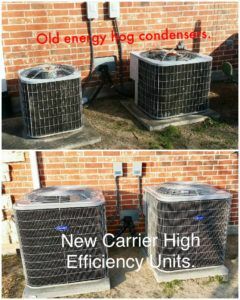 Many customers simply need to replace an older condenser unit and update the air handler to match. You can trust our professionally-trained, certified technicians to install your air conditioning system right the first time and on-time. The Environmental Protection Agency (EPA) recommends air conditioners over 10 years old and furnaces greater than 20 years old, be replaced for operational efficiency. The great thing about the efficiency gained from new installations is that it leads to a reduction in energy consumption. This will save you money in monthly utility costs! Attic ventilation and insulation – A properly ventilated attic will extend the life of your air conditioning system and save you 15% to 20% on your utility bills. No matter the system or challenges a home may present, Ellis Air Conditioning and Heating has the perfect solutions to meet your needs. Our team is ready to install your home’s new system today. Our skilled technicians have the know-how to diagnose, adjust or repair your system to get it back up and running quickly.